In recent years, food sovereignty has emerged as a way of contesting corporate control of agricultural markets in pursuit of a more democratic, decentralized food system. The concept unites individuals, communities, civil society organizations, and even states in opposition to globalizing food regimes. This collection examines expressions of food sovereignty ranging from the direct action tactics of La Vía Campesina in Brazil to the consumer activism of the Slow Food movement and the negotiating stances of states from the global South at WTO negotiations. With each case, the contributors explore how claiming food sovereignty allows individuals to challenge the power of global agribusiness and reject neoliberal market economics. 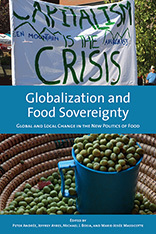 With perspectives drawn from Europe, the Americas, Asia, Africa, and Australia, Globalization and Food Sovereignty is the first comparative collection to focus on food sovereignty activism worldwide.